If you want to head out for a snorkeling tour with loved ones, you need to be really prepared for the whole adventure. The best way to do that is to get the right gears for the game. To do that you should first understand what to wear snorkeling. It helps you to stand under water for extended timelines. Note: when testing for snorkeling mask, pay attention to any air leakage as this will be a pointer to a poor-fit mask. Reading the best snorkel mask reviews and also looking at user feedback will also give you the best brand to buy. A mask defogger will help in preventing your snorkeling mask from getting fogged up. You should, however, choose a defogger that’s non-toxic. It should also be biodegradable and if possible alcohol-free. Taking these tips into considerations will help you to keep safe from the reefs and also the inhabitants. 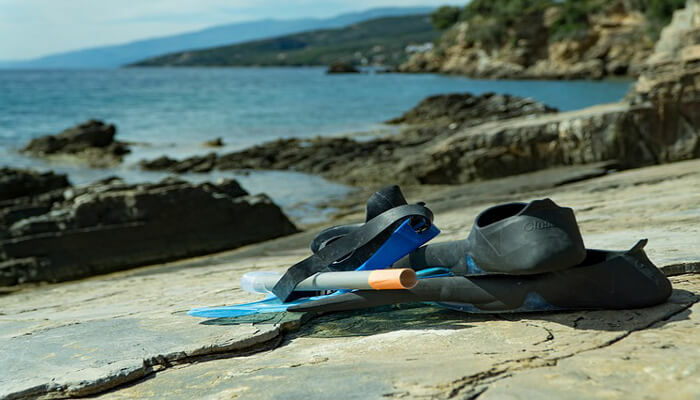 One trick that works for most snorkelers though is to spit into the snorkeling mask and use the saliva to rub around before finally washing it off and using the mask. The snorkel is the part of the facial snorkeling gear that has the pipe and a section that attaches to the mouth. The most important factor when choosing the best snorkel is to focus on the mouthpiece. You should look for a mouthpiece that actually feels pretty much comfortable. Focus on finding the best purge valve. This is often a vital feature that will let the water out but prevent any from going back in. For people who are wondering what to wear snorkeling (on the head), using a swim cap is super cool. It will keep your hair tucked under the cap and prevent it from tangling onto or getting into the snorkel. In addition to that, the cap will also prevent the scalp from burning up in case you are out there on a sunny day or under the hot summer sun. In case you are looking for a better snorkeling cap on the low you can always choose the surgical caps which doctors often wear as they come with super cool ties which prevent any slip offs when you are out in the water. Snorkeling vest as it is often called isn’t so much of a necessity if you are a pro swimmer. However, for the newbies of people who are just starting out on snorkeling going with a float vest isn’t such a bad idea after all. As a matter of fact, you need to be a good swimmer to be good at snorkeling too. So before you get your moves right, you should consider purchasing or renting a floating vest to help you with buoyancy. Apart from keeping you warm when under cool waters, a wet-suit will also help in the prevention of sunburns. In addition to that, it also offers the perfect protection against any form of stingy particles that you could encounter in the ocean. Wet-suits are also good at maximizing buoyancy and indeed keeping you afloat. Wet-suits with short sleeves and the leggings that don’t go beyond the knee are also perfect for the water that isn’t so cool. You can use them to swim really comfortably, plus if you are looking for an easy to pull on the suit with a compact touch for storage, this wet suit will come in handy. Sometimes the water is often too warm for the wetsuit. If this is the case for your area, a rash guard will be the best remedy. It will provide the exact protection a wetsuit will provide from stingy bites and also from the harmful UV rays of the sun. When snorkeling, it is important to use a reef-friendly sunscreen. This should be a biodegradable sunscreen. This way it won’t be possible to damage the reefs that you went down there to see in the first place. Shorter fins are the best for snorkeling. They are easy to change direction with as they aren’t heavy. In short, they are easy to kick so much so that if you wore them throughout you won’t feel any fatigue in your knees. Having chosen your best places to snorkel, it won’t mean that the game is over, hell no! Even the best snorkeling fins can still cause severe blisters on the feet and most probably at the back of the ankles. Wearing neoprene socks will provide the right type of cushioning and comfort that you need to ensure that you protect your feet pretty well. If you were wondering what to wear snorkeling I believe you have your answer now. Just take your time to get quality products so that you don’t get disappointed at the end of the day. Otherwise, good luck in your next snorkeling adventure.